Welcome to Lunchtime LEVinars, free, interactive, online webinars on important and timely issues hosted by the League of Education Voters (LEV). These lunchtime webinars are designed to share information and build knowledge about the issues at the core of LEV’s policy priorities. LEV will host each 30-minute webinar, which will include a 15–20 minute presentation by an expert from the field and 10 minutes of Q&A. Each webinar will be recorded and archived on our website. In order to learn, students need to feel like school is a place where they are supported. 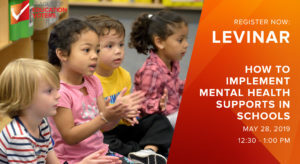 A key component is providing reliable and consistent access to mental health services for students through either staff or third-party providers in every school building. In our free webinar, team members from the University of Washington’s School Mental Health Assessment, Research, & Training (SMART) Center will describe how to encourage and enable school districts to create positive, supportive school climates by implementing a multi-tiered system of support (MTSS) framework to identify and meet student needs. They will also answer your questions.